Pan American Bank celebrates 45 years with a public salute to the woman who became the first Mexican-American to serve as U.S. Treasurer. A celebration of California’s oldest Latino-owned bank this Saturday in East Los Angeles will also serve as a tribute to one of its principal founders and longest serving presidents, Romana Acosta Banuelos. Pan American Bank’s 45th anniversary celebration at its East Los Angeles based-headquarters is open to the public and will feature a festive celebration of music, folkloric dancers and children’s activities . The bank will host a noontime ceremony to honor the first Latina to serve as U.S. Treasurer who for years was the highest-ranking Mexican-American in government. Pan American Bank was originally established in 1964 as Pan American National Bank. The bank serves Latino communities with two branch offices in Los Angeles and one in Santa Ana. Banuelos and some businessmen founded the Pan American in East Los Angeles with a plan to bankroll Latinos who wanted to start their own business, according to an online U.S. Department of State profile of Banuelos. Banuelos believed that if Latinos could increase their financial base they would have more political influence and be able to improve their standard of living. Jesse Torres, the bank’s current president, called Banuelos a “business icon” and credited her professional success for his own success in banking, and as the primary reason for joining the business this past June. In 1970, President Richard Nixon personally chose Banuelos to serve as the 34th Treasurer of the United States. On Dec. 17, 1971 she became the first Latino to serve in that position. Today, current U.S. Treasurer, Rosa Gumataotao Rios is the sixth Latina to occupy the post. Banuelos’ biography portrays the kind of classic rags-to-riches tale possible only in America. The daughter of poor Mexican immigrants, Banuelos was born in a small mining town in Arizona on March 20, 1925. During the Great Depression of the 1930’s and the country’s repatriation of hundreds of Mexicans and Mexican Americans, the family was persuaded to voluntarily relocate back to Mexico, her daughter Mona Banuelos told EGP. Banuelos married and had two sons, Carlos and Martin, by age 18. By 1943 she was divorced. Banuelos lived in Juarez, Mexico where she would cross over the border to a job she held in El Paso, Texas. After hearing about better paying jobs in Los Angeles, Banuelos approached her mother with a plan to move to the U.S..
With her mother’s approval, she moved to Los Angeles where she found work as a dishwasher. With her two sons living with their grandmother in Mexico, Baneulos dedicated herself to work, spending long hours washing dishes before eventually landing a job as a waitress. It was during her time as a waitress that she was introduced to the restaurant and food industry. At age 21 she married Alejandro Banuelos. By that time she had saved enough money to start her own tortilla factory. The factory would eventually become Ramona’s Mexican Food Products, Inc. Today it is a multi-million dollar family business. By age 21, Romana Bañuelos (right) had started her own tortilla company. She went on to become the first Latina US Treasurer and founder of Pan American Bank. 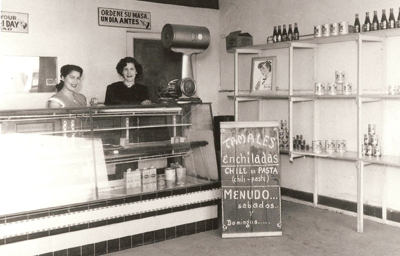 With the growing success of the Mexican food products business, Banuelos soon found herself in the banking business after several businessmen recruited her to help start Pan American National Bank in 1964. The businessmen had first approached her husband, Alejandro, but he passed on the idea and suggested his wife for the role instead. Banuelos was selected to serve as chair of the bank’s board of directors in 1969. She would go on to serve three terms as bank president while simultaneously serving as president of Ramona’s. The attention-to-detail Banuelos brought to her business life often found its way back home, said Mona, who added her mother would micromanage the kitchen during Thanksgiving dinner preparations. Mona said this hands-on approach was evident in her unusual approach to finances. “For a long time I never understood why she never invested in the stock market,” Mona said. “Why would I ever invest in something I am not a part of or control,” is the response Banuelos gave her daughter. Pan American provides financial literacy workshops to recent immigrants to educate them on their options when it comes to the business of handling their money. He said many recent immigrants tend to distrust banks due to past experiences with state-owned banks in their native lands. He said the bank works to provide the immigrant community with a safe and secure financial partner to counter predatory check cashing businesses that dominate Latino communities. With 100 percent of his staff being bilingual, Torres said Pan American is able to develop the personal relationships Latinos desire when it comes to business. He credits this approach to the bank’s ability to avoid the troubles many financial institutions have experienced in the current recession. “The great thing about [Pan American] is that we are a blue-collar bank,” Torres said. He said 88 percent of Pan American’s loans are small-scale mortgages. Despite the record number of foreclosures throughout the Southland, the bank only has one foreclosure on its books. Torres credits that low number to the close relationship his staff develops with its customers as well as the banks overall approach to business. Pan American is currently rebuilding its Website that is set to premier in a few weeks. The revamped Website will offer customers updated features such as online banking that is still new to many of its Latino clients. In addition to online banking features, new plans call for Pan America to offer check cashing and wire transfers to offer Latinos without bank accounts a safe place to do business. Mona credits Torres for pushing the bank through its new growth. She said her mother was reluctant to grow the bank because she often looked to avoid risks. Updated 11/02/2009 to add information about repatriation. Updated 1/24/2018 to correct punctuation errors. October 22, 2009 Copyright © 2012 Eastern Group Publications, Inc. This is such an inspirational story! What a great story. This is an inspiration to all people, no matter who they are or where they come from. Congratulation on your 45th anniversary. Many more to come. Could be possible for her daughter to make a presentation to a group of Hispanic woman. This is such an inspiration. I worked for Mrs Banuelos back in 1991, in Pan American Bank on 1st street, and this is my experience with her. She is the worst cheapskate in the world, she thinks people who work for her should pay her for her knowledge and accomplishments. I stated as a clerk,worked my way to Accounts Payable`s clerk,got paid minimum wage as most all are in her Banks,was commissioned to negotiate an Add /Advertizing deal with a local Radio Station , after some of my dealings with the Radio Station i saved the Bank 12,000 bucks for the year and got more Air time than ever before. When i presented the deal to Mrs Banuelos or Mrs B. as shes is commonly refereed ,she thank me and said that i did well blah blah, so i decided that since i saved the bank 12,000 bucks i would ask for a raise , so i typed a nice letter asking for a raise, due to my 6 months performance, and my growing financial responsibilities.I asked for 2 bucks an hour more, way below what an AP Clerk was supposed to be paid then,so i asked for 4,000 bucks more a year,had just saved the bank 12,000 for the year in Adds…so as a thank you she fired my right then and there..!! She was bossy and condescending to all in the Bank, She has the wrong idea that if you do not reach her levels of accomplishments you then are a failure, she is the best, just ask she will tell you.! Yes you learn a whole lot if you work there, much more than if you go to School, things are done in the Bank like they are done in the Treasury Dep. no non-sense crap there,in exchange you will be ridicule, bossed around , talked down to and will get paid minimum wage as a reward. It was a trade, a tough love school , many went from there to very high paid jobs, she placed 2 US Treasures from her Bank Staff, so she is not all bad, her problem is this, she know how good she is, and she is GOOD.!! !